Given its massive worldwide popularity, I’ve always wondered how many Westerners still think of Mahjong as a single-player game. Real Mahjong plays rather more like poker, with complicated betting and scoring. Of course, TT Mahjong does very little to dispel any misunderstandings about the game, eschewing the centuries-old traditional game in favor of the Mahjong Solitaire version created by a white American guy in the 80’s. I’d be surprised if you haven’t played a Mahjong game like this in the past, but just in case, here’s a quick overview. You start off with an arrangement of tiles. Each tile has 4 matches, some covered by others. You can remove them in pairs, provided that the tile is uncovered and open either to the left or the right. The object is to remove all the pairs. TT Mahjong really doesn’t do anything to mess with this model, although it does do a few things that I think make the game markedly less enjoyable. First off, the menu is utterly bewildering. I launched the app and was immediately greeted with photos of a dog, a cat, a bird, a hamster, and no text aside from the title. Guh buh wha? Not a particularly promising start. Eventually I figured out that tapping the various animals launched different levels, but that didn’t really assuage my misgivings. 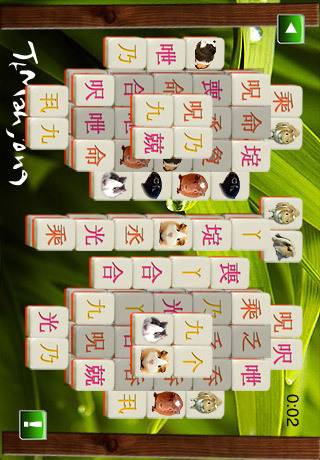 Unlike the familiar blend of graphics and Chinese characters, the tiles were almost all characters. Intimidating, to say the least, for a non-Chinese reader. While playing the dog level, the few sets of non-character titles were covered by, you might have guessed it, pictures of dogs. Now, I like dogs, I really do, and the photos were cute, but these were not in any way inspired graphics. In fact, the visual layout of the game is just odd. Although the game area is landscape oriented, the little clock bar at the top of the screen remains in portrait orientation, limiting the play space and just looking really bizarre. There is also no music, and the sound effects are only so-so. Control sensitivity is adequate, but in general, the game feels very amateurish. With only four layouts, insipid graphics and lame sound, TT Mahjong is really scraping the bottom of the barrel here. It still functions like a regular Mahjong solitaire game, but there are much better versions out there, and I wouldn’t pay money for this one, even if I were the most dedicated pet lover. AppSafari review of TT Mahjong was written by Tracy Yonemoto on April 14th, 2010 and categorized under App Store, Games, Puzzler. Page viewed 3303 times, 1 so far today. Need help on using these apps? Please read the Help Page.